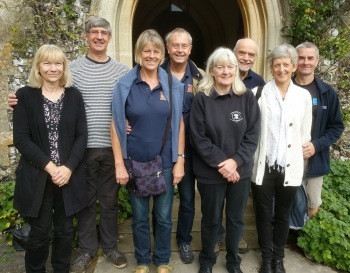 Rung to celebrate the Ruby Wedding Anniversaries of the whole band during 2018: Martin & Maggie on 24 June; Nigel and Jenny on 22 July; Robert & Tricia on 26 August; Graham & Janet on 16 September. Janet, Graham, Jenny, Nigel, Tricia, Robert, Maggie, Martin. Last updated Tuesday, 16 October 2018 at 18:00:36. First submitted Tuesday, 16 October 2018 at 17:57:57 by Graham A C John. Sent for publication in The Ringing World on Thursday, 18 October 2018 at 00:01:38, and printed in issue 5610, page 1061. This performance has been viewed 1641 times.